One of the Faculty Members of the Department of International Relations at Bina Nusantara University, Wendy Andhika Prajuli, published an article titled “Islamic Ideas versus Secularism: The Core of Political Competition in Indonesia”. The article is as follows. The implementation of sharia law in Indonesia has been increasing ever since democratization in 1998. The country’s Kompas newspaper reported in August 2015 that there are currently 443 peraturan daerah (local regulations) related to Islamic law. This growth of Islamic ideas in Indonesian politics challenges the secular ideology that the nation’s foundation was based on, yet this Islamic challenge to secular Indonesia is not a new phenomenon; competition between Islamic and secular ideas has existed during every phase of the republic’s development. In reality, this rivalry is at the core of Indonesian politics. Islamic and secular philosophies have developed and competed in Indonesian politics since even before independence. In the pre-independence era, the idea of ruling the society based on Islamic teachings can be traced back to the Padri movement in Minangkabau, West Sumatera. This was a movement by Muslim clerics, who had recently returned from Mecca and wanted to impose sharia laws on Minangkabau society. This caused conflict with the nobility and the traditional chiefs who wanted to retain Minangkabau customs. The Padri movement was a non-political movement that focused on doctrinal and normative issues, such as bid’ah (innovation), polytheism, tomb veneration, correct attire, and the use of products made by non-Muslims. The first time that the dispute between Islamic and secular viewpoints turned into a political argument was on the issue of Sarekat Islam’s (SI) organizational platform. In its early years, one of the SI’s biggest problems was whether to change its organizational platform into an Islamic one or for it to remain open to accommodate the communist faction. This deliberation led to conflict between the leaders of SI Semarang, who were supporters of Communism, and other SI leaders, who were supporters of Islam. This political dispute concluded with the exclusion of all members of SI Semarang from the organization. Another disagreement concerned the notion of nationalism as the foundation of the republic. For Islamic leaders, such as Agus Salim, Mohammad Natsir, and Ahmad Hassan, nationalism was considered to be jahiliyyah, it threatened the Islamic concept of Tawhid, and would lead to chauvinism. Salim believed that Sukarno’s idea of nationalism was chauvinistic and “enslaves man to the fatherland-idol, leads to competition and rivalry for the acquisition of wealth, honour and pride, to the suppression, enslavement and danger of the fatherland of others without regard to rights and justice.” In contrast, Indonesian leaders such as Sukarno and Cipto Mangunkusumo, appreciated nationalism for its potential to gain independence, and for its ability to bring together in one nation, people from different ethnicities, holding diverse ideologies, with various faiths or religions. By the late 1930s, the Islamic group started to come around to the idea of nationalism as well. Prior to the declaration of Indonesia’s independence in 1945, another debate arose between the Islamic and the secular groups. The Islamic group rejected the then fifth principle of Pancasila, which was ‘belief in God’. The reason for this was that “Islam was being treated as if it were no more important than any of Indonesia’s other deist religions”. The debate concluded with, firstly, the release of the Jakarta Charter that contained the statement: “belief in God with the obligation for adherents of Islam to carry out Islamic law”. However, the Charter was never implemented because it was rejected by areas of Indonesia that were dominated by non-Muslims. Later, in 1968 as well as in the early 2000s, Muslim groups again attempted to apply the Jakarta Charter, but, on both occasions, its implementation failed due to insufficient support from others. The second and third conclusions of the debate were the change of ‘God’ into ‘God almighty’, and the switch of this newly-worded principle to be the first principle of Pancasila, rather than the fifth. After the Declaration of Independence on 17 August 1945, conflicts between the two ideologies continued. In 1949 Kartosoewirjo, a Javanese Muslim, declared the establishment of a Darul Islam – or Islamic State – in West Java. It was his expression of disappointment over the Renville Agreement between Indonesian and Dutch leaders. After his declaration, Kartosoewirjo started to gain support from some local leaders. 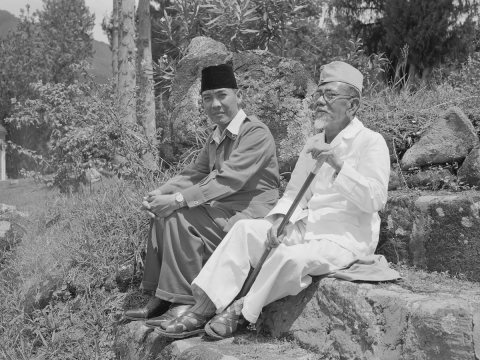 Amir Fatah of Central Java joined in 1950, while Kahar Muzakkar of South Sulawesi declared his affiliation in 1951. They were followed by Daud Beureuh of Aceh in 1953, and Ibnu Hadjar of South Kalimantan in 1954. In 1962, the government succeeded in crushing the movement. Also during this era, Islamic and secular ideologies clashed between the nationalist and Islamist groups in the Konstituante (Indonesian Constitutional Assembly), with regard to the question of whether Islam or Pancasila should be the foundation of Indonesia. This led Sukarno to dissolve the Assembly and establish guided democracy. In his guided democracy system, Sukarno tried to harmonize the conflict through Nasakom (Nasionalisme, Agama, Komunisme or Nationalism, Religion, and Communism). Unfortunately, he failed and the conflict between Islamists and secularists intensified, especially between the Indonesian Communist Party and Nahdlatul Ulama. The latter then entered into the anti-Communist movement, which culminated in one of Indonesia’s biggest human tragedies. In the mid-60s Sukarno’s administration fell and Suharto took over the presidency and thus power of the country. Suharto was aware of the political segregation in Indonesia, and decided to divide the Indonesian political parties into two camps, namely secular-nationalist and Islamic. During his administration, Suharto depoliticized Islam and applied pressure on the Islamic political movement. At that time, “any attempt by Muslim groups to attain that public political space was suspected and labelled as an anti-government act”. He also implemented a policy of asas tunggal, which determined that Pancasila would be the sole ideology of all organizations in Indonesia. Consequently, Islamic groups turned their focus from political to cultural movement. But then, from the early 1990s, Suharto loosened his policies towards Islam. In this period, he allowed more room for Islamic ideas, albeit only in non-political spaces. In addition, he supported the building of many new mosques, and the establishment of Ikatan Cendekiawan Muslim Indonesia (ICMI) [Indonesian Association of Muslim Intellectuals] as well as Islamic banking and insurance. It was in the post-Suharto New Order period that Islamic ideas found their momentum. In 2002 and 2004, Muslim groups resurrected the Jakarta Charter during constitutional amendments; yet again, a lack of support thwarted their attempts. Despite this setback, the implementation of local sharia law increased. There are 422 local sharia laws in Indonesia; 40% are related to morality, 15% to faith, 9% to finance, 6% to education, 6% to attire, and 10% to various other issues. The province with the highest number of these regulations is West Java (86 regulations), followed by West Sumatra and South Kalimantan, with 54 and 38 regulations respectively. Pragmatist and normative are the characteristics of this current phenomenon. In the past, Indonesian Muslim leaders applied Islamic concepts idealistically, whereas the political elites nowadays use Islamic ideas more pragmatically. For example, they once promoted Islam as the foundation of the State, but now tend more to exploit those ideas to gain political support and power, seeing them as little more than political tools. Research by an Indonesian NGO reveals that Islamic ideas or issues are now used by political elites and government to improve their image and gain public trust, as well as to win elections. The use of Islamic ideology to gain popularity, and voters, has instigated an ‘Islamisation race’ between Islamic and non-religious parties. Most of the Islamic notions that manifest themselves in local sharia law, as listed above, refer to normative issues, such as morality, attire, and faith. Furthermore, these sharia regulations can be grouped into three categories: those that regulate public order and social problems, such as prostitution, gambling, and alcohol consumption; those that are related to religious skills and obligations, such as reading the Qur’an and attending Friday prayer; and those that are related to religious symbolism, such as adhering to Islamic dress codes. This indicates a shift from the early period of the Republic where the dynamics were about ‘big issues’, for instance, the foundation of the State and nationalism. Sharia law has attracted opposition from some elements of society, such as law makers, human rights defenders and women’s groups. They consider it to potentially violate human rights as well as discriminate against minority groups. Public debates between the proponents and opponents of sharia law are frequent and usually controversial. To conclude, the rivalry between Islamic ideology and secularism in Indonesia has shaped the country’s politics since pre-independence. This political struggle will never end and will always be repeated, because it is at the core of Indonesian politics. The government and its society have to be cautious about these political dynamics since they can be an entry point for radical Islam and its beliefs. Lecturer at the Department of International Relations, Bina Nusantara University, Jakarta; PhD student at the School of International and Public Affairs (SIPA), Jilin University, China (w.andhika@gmail.com).